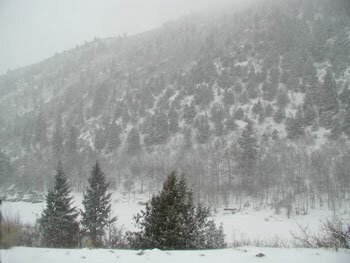 A snow storm was picking up on Friday, November 10. This was taken out the passenger window will driving south on West Elk Road. Greetings from New Castle Colorado. In place of this week's regular WesternHunter.com e-mail we will be bringing you a special hunting report from Colorado. Jerry Springer, Editor of WesternHunter.com, is on location in Colorado for the fourth elk season which runs from November 11th through the 15th. Jerry will be hunting with seven other hunters, two from Pennsylvania and the other five from California. Depending on the hunting conditions, Jerry will attempt to give you daily reports. Watch for possible daily e-mails.